A good bike fit can maximize the performance of an athlete on a properly sized and set up bicycle. Conversely, the best bike in the world will hinder an athlete if not fit properly. Budget for a professional fit from someone who knows you and understands the kind of riding you do when purchasing your next bike. You'll be glad you did. Don't like the way your current bike feels? It might not be the bike, it might be the fit. A number of new tools and fit "systems" have come about over the past decade. Better tools are always a good thing, however the best tools in the world are only as good as the person using them. Don't choose a fit based on the technology being used, choose based on the expertise of the person doing the fitting. Can you talk to this person? Do they ride bikes? Are they familiar with the kind of riding and/or racing that you do? A short conversation, where you tell a fitter what you don't like about your current position, can go a long way towards telling you if the fitter understands you, and understands what might be improved in your position. Likewise, "systems" can be valuable tools in developing a baseline, or starting position for any fit. However, if bodily dimensions could be input into a program and the perfect fit could be determined for a particular type of riding, then bike fitting could easily be reduced to a science. For better or worse, different bodies bend in different ways, and different athletes come with different combinations of strengths, weaknesses, likes and dislikes. Every athlete presents a unique fitting challenge, and should be treated that way. In that regard, while we base many of our practices and decisions on the science available, we also recognize there is an art to fitting, as well as an aspect that involves listening to and really understanding each athlete. In using the basic tools that have served fitters well for years, and in not paying a licensing fee to one of the fit "systems", we are able to keep prices at an affordable level for most athletes. As coaches performing fits, rather than shop mechanics, we are able to envision what riders will be doing out on the road in training and racing situations. We're always thinking about the end result, how this position will enable the athlete to maximize their performance, maximize their enjoyment, and meet their goals. John and Tom are available for road bike fits, cyclo-cross bike fits and time trial bike fits. $150 per bike. Contact John to schedule. A special note on cyclo-cross fits: If your road racing and 'cross racing bikes are set up with identical positions, one of them is not optimal. These two sports have their own sets of demands, and there are different priorities with regard to issues like weight distribution, aerodynamics, etc. Cyclo-cross fits are their own unique item, and we treat them as such. These are not just for elite athletes either, a too-high seat or too long a reach can make learning the basic skills of cyclo-cross much more challenging for a beginner, and much harder to master for an intermediate rider. We conduct clinics and instruct these skills as well, so we see at nearly every camp or clinic we run how a poor fit can impede a rider's learning curve - and their enjoyment of 'cross. It has become apparent over the last several years that 'cross-specific fits are a skill set that only a few fitters really have, perhaps because of the smaller market, perhaps because fewer fitters race 'cross. That's fine by us. We love 'cross, we race 'cross, and we love enabling athletes to maximize their performance in this discipline. cornering; which I think may be attributed to these adjustments. So again, thanks. Regarding the TT bike, the fit is perfect. Nothing else to say in this area." —Mindy Caruso. 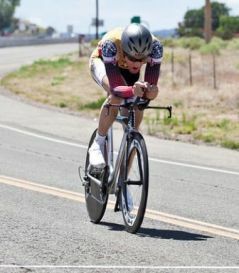 2011 Masters National Time Trial Champion and best All-Around Rider (35-39).